I was going to call this post “Breaking down a brick wall with DNA”, but decided that would be false advertising. I’m hoping that eventually this will become a case study (to go along with my case study on Using mtDNA for Genealogy), but first I have to actually break down a brick wall. But I’m nothing if not optimistic, so consider this a case study in progress! As do most of us, I have a number of brick walls. Over the past few years, I’ve intermittently worked at some them, with varying degrees of success. I’m hoping that DNA can help me break through at least a few. I did my first autosomal DNA test at the beginning of 2015, with Family Tree DNA (FTDNA). Since then, I’ve also tested with AncestryDNA, have tested my mother on both FTDNA and Ancestry, and have tested a couple of other family members on Ancestry. I’ve uploaded our results to GEDMatch and MyHeritage. I’ve decided to pick a brick wall and chip away at it systematically until it crumbles. I’m going to focus on John William Kirkland and Elizabeth Weeks (okay, that’s two brick walls, but they were a couple, so it makes sense to work on both of them). 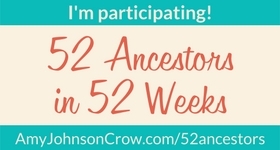 I wrote about Elizabeth Weeks in my first 52 Ancestors post. John W. Kirkland will likely be the focus of a future post. John and Elizabeth were the grandparents of my great-grandmother, Wilhelmina (Minnie) Kirkland. I have a critical mass of matches on this line. To date, by using shared matches and building out some people’s trees, I have identified 12 family groups who descend from 4 of their 9 (or so) children. I have a great collaborator on this research, a 4th cousin who is also a Kirkland/Weeks descendant – Andrew McKnight (who is also a very talented musician – check out his website!). I have already done a lot of traditional genealogy research on this family, so I have a good starting base. Most of this has been documented on the WikiTree profiles of John William Kirkland and Elizabeth Weeks and their children. Charles Leonard Kirkland was born in March of 1841 in Miramichi, Northumberland County, New Brunswick, the fourth child of John V. Kirkland and Elizabeth Sarah Weeks. The Weeks family had emigrated to New Brunswick from England circa 1820 and John Kirkland, a silk merchant, had emigrated to New Brunswick from Glasgow, Scotland in the early 1830’s. Following their marriage, they moved frequently between New Brunswick and Prince Edward Island, as John built up his importing business. Charles spent his early years in Miramichi where his older brothers, John (born in 1832), James (born in 1835) and William had also been born and raised. The family relocated to Summerside, Prince Edward Island in 1845, where the first daughter of the family, Lavinia Rebecca, was born in 1849 and the youngest child, Emma Lydia, was born in 1855. John V. Kirkland…a silk merchant, had emigrated to New Brunswick from Glasgow, Scotland in the early 1830s. I’ve found no evidence that he emigrated from Scotland in the 1830s. Every source I have found has him born in New Brunswick (maybe Boiestown? ), probably around 1802 (though sources vary). Perhaps his father came from Glasgow? I’ve found no evidence that she emigrated from England around 1820. Anything I’ve found on her children that lists their mother’s place of birth has either New Brunswick, Prince Edward Island or the United States. Not England. Following their marriage, they moved frequently between New Brunswick and Prince Edward Island, as John built up his importing business. Charles spent his early years in Miramichi where his older brothers, John (born in 1832), James (born in 1835) and William had also been born and raised. They did move between NB and PEI, as they had children born in both provinces, though I don’t think it was to build up an importing business. I’ve confirmed sons John (my 2g grandfather) and James, but I’ve found nothing on a William. My 2ggf’s name was John W. Kirkland – I’m assuming the W. is William, like his father. Was there a son William as well? There was an older daughter, Rebecca Melvina, b. 1834 in New Brunswick. She married in 1854 and died in 1857. Lavinia (seen in records as Leavinia) was probably born about 1844. There is a New Brunswick late registration of birth stating she was born in 1849, but considering she had her first child in 1860, 1844 is more likely. Her birth record was created in 1929, when she was about 85, so it’s not a surprise that the year is wrong. Emma Lydia was indeed born in PEI, likely in 1855 (sources vary). He left Tuxford in November of 1911 to sail to Glasgow, Scotland to settle the estate of his fathers two brothers, who were reputed to have owned a business in Glasgow which was to be inherited by the John V. Kirkland family in America. Charles was commissioned by the family to settle the estate in the interest of the entire family. The article includes a photo of a letter sent by Charles to his daughter from Glasgow, which includes the line “I have not yet found any of Uncle’s brothers and if I can’t find them I won’t be able to get the money”. I’ve tried to use this information to make a connection to Kirklands in Glasgow, but so far, to no avail. There was a Kirkland who died in Glasgow in September 1911, but he was far too young to have been an Charles’s uncle. I’ll write more about this in a later post. Started reviewing other match’s trees to look for common surnames/locations. So far, Woodworth and Blakely are names that keep popping up, but I’ve not yet determined if there’s a link. Now that I’ve identified a number of matches who are descendants of John Kirkland and Elizabeth Weeks, other people who multiple known descendants, or who match on a DNA segment identified as having come from this couple, are either a) also Kirkland/Weeks descendants or b) descendants of an ancestor of either John Kirkland or Elizabeth Weeks. This latter group could help me break through the brick walls. Contact relevent GEDMatch matches to see if they have trees I can view. In addition to using DNA, I’ll continue with traditional genealogical research. Specifically, I’d like to try to track down the sources used in the Encylopdia Titanica article, to see if this might help reconcile the differences I’ve found. I plan to blog about the various techniques I’ve already used and my future research, so if this interests you, stay tuned. I’ll use the category “Chipping Away at a Brick Wall” for anything related to this research. If you’re a descendant of John William Kirkland and Elizabeth Weeks and you’ve done a DNA test (or plan to), please do let me know and I would be most appreciative if you would upload your results to GEDMatch (there are step by step instructions here). Even if you don’t match me or my mother, you may match some of the other known descendants. Even if you have not done a DNA test, I’d love to hear from you. You just may have the piece of the puzzle we need!